Ever have one of those days? I’ve been having a few lately. It’s enough to drive you to drink. Since I’m in this frame of mind I thought I’d post a liqueur. It’s been a while, I know. In celebration of hopefully more warm weather I’m posting one that has to age in the sun. For four weeks no less... So you’ll have it for August. I believe this is the longest ageing of any liqueur I’ve written about. It’s worth it though. Curaçao is a liqueur flavoured with the dried peel of the laraha citrus fruit, grown on the island of Curaçao. A non-native plant similar to an orange, the laraha developed from the sweet Valencia orange transplanted by Spanish explorers. The nutrient-poor soil and arid climate of Curaçao proved unsuitable to Valencia cultivation, resulting in small bitter fruit on the trees. But the aromatic peel maintained much of the essence of the Valencia varietal, and the trees were eventually bred into the current laraha cultivar, whose fruits remain inedibly bitter. The drink was first developed and marketed by the Senior family (an old Caribbean family of Spanish Jewish descent) in the 19th century. To create the liqueur the laraha peel is dried, bringing out the sweetly fragranced oils. After soaking in a still with alcohol and water for several days, the peel is removed and other spices are added. 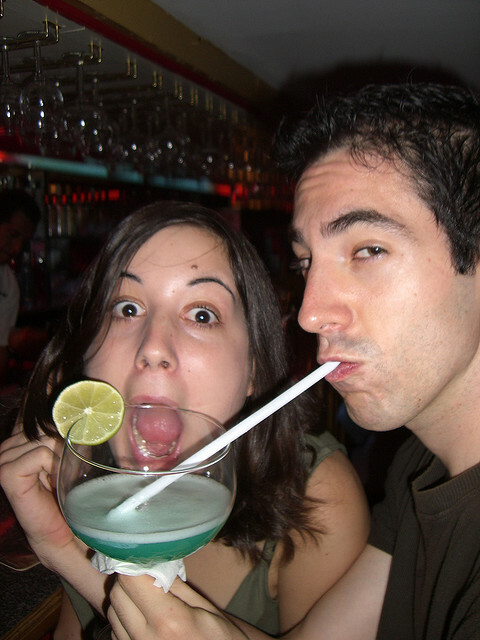 The liqueur has an orange-like flavour with varying degrees of bitterness. 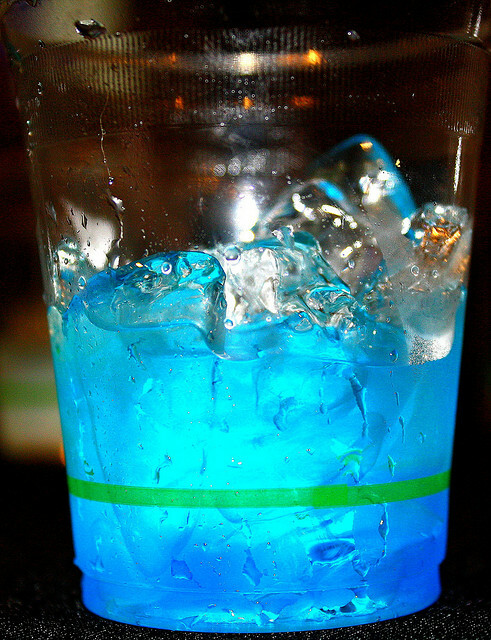 It is naturally colourless, but is often given artificial colouring, most commonly blue or orange, which confers an exotic appearance to cocktails and other mixed drinks. So there you have it. 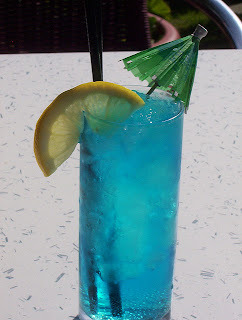 Any drink that you’ve seen that’s blue has curaçao in it. Since it’s a bit difficult to get hold of laraha fruit, we use seville oranges which have a somewhat similar bitter peel. I found this recipe on the web a few months ago. I’ve tried to find the source but I can’t. So I’ll just have to send out a general thank you to whoever posted this summertime drink staple. can't be, because they have cream. Peel oranges and cut each section in half. Put in a large sealable jar along with the peel, cloves, coriander and cinnamon. Add sugar, vodka, and water. Shake until the sugar is dissolved. Place out of the sun to infuse for 4 weeks. Strain the liquid through cloth (or a very fine sieve) and allow to sit for any remaining sediment to settle out. This may take up to 2 weeks. 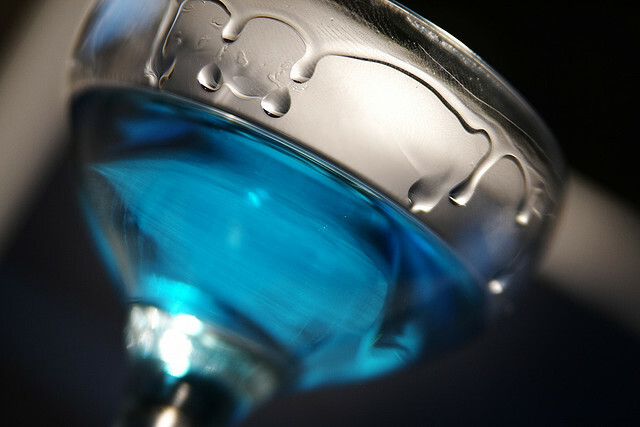 When settled, carefully pour off the clear portion and bottle. Do not include any liquid that has sediment. Add blue food dye to colour. 3 questions- When do we add the sugar and water, and are the peels put in whole, with the white part? How did it taste? Thanks for posting this! Oops, never mind about the adding sugar and water part. The peel is added in strips with as little white pith on it as possible. The white part is bitter. As in all homemade liqueurs it isn't exactly the same as purchased, but still very good!